72: The Dark Knight Returns – Claire’s Birthday Spectacular! We’ve entered the month June, and that means it’s time for Claire and Kyle’s “Birthday Spectactulars”! 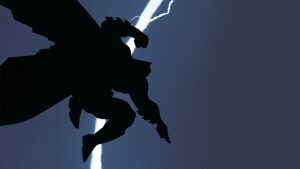 Frank Miller’s graphic novel The Dark Knight Returns is one of the most influential works in the history of Batman and of comics. It also arrived in the world the same year Claire did! That makes it a perfect pick for her birthday special. Claire describes the enormous impact the book had on the industry and explains how the censorship that was plaguing comics set the stage for Miller’s work to be such a noticeable departure. Kyle continues with a look at how a young Miller came to be trusted with so much creative control over Batman, and what led him to use it the way he did. Our hosts conclude with a discussion of Batman’s enduring appeal, their favorite Batman villains, and their thoughts on the graphic novel.